When I was growing up, my reading material consisted of comics Twinkle, Mandy and the legendary Jackie magazine. My parents read The Daily Mail and occasionally The Daily Telegraph but this was decidedly ‘adult’ territory. Today news is accessible 24 hours a day across a huge range of platforms both online and off. We are, arguably, better informed than ever before – and this creates a great opportunity for our children. Caitlin and Ieuan sometimes watch the TV news with us but this is an activity which usually raises more questions than it answers. Sometimes we have found ourselves discussing sensitive issues which, in all honesty, our kids are not yet ready to deal with or have the intellectual maturity to process. I firmly believe that our kids should know what is going on in the world without being made anxious or afraid. 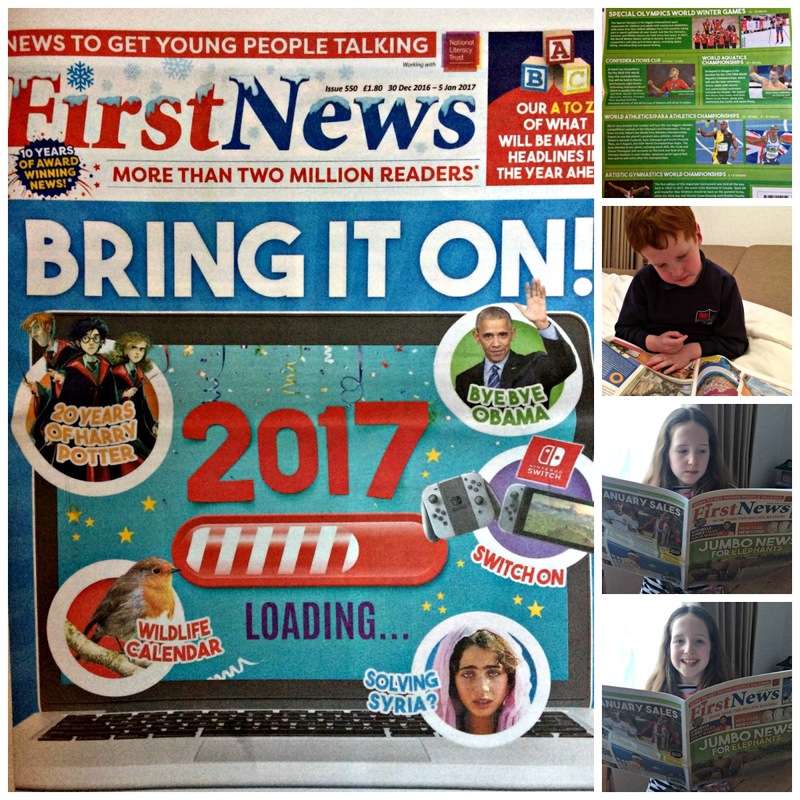 First News is a weekly newspaper aimed at 7-14 year olds which aims to get kids talking about the news in an easy to understand and non-threatening way. The paper covers those issues which are relevant to children and which specifically affect them. It’s extremely comprehensive and just as interesting a read for adults as it is for a child because you are given the main facts without the fluff or the political bias of the journalist (Piers Morgan, anyone?). The paper is printed in tabloid format with bright colours and a decent size print (great for us varifocal wearers too!). Caitlin loved the animal section and the puzzles whilst Ieuan turned straight to the sport. It’s great for kids to have their own paper to keep up with their parents. Rather than spending time in restaurants with the kids playing iPads, First News gives us some conversation starters. For example, our first edition, 30 Dec – 5th January covered Syria, the departure of Obama and had an A-Z feature about the key events of 2017. There is a distinct benefit in giving kids their own newspaper as opposed to letting them consume news online – that parents can monitor the information they are exposed to. Actually, I think we’re all going to be better informed and First News certainly complements many of the topics the kids are learning in school. There’s no harm in creating informed, interested kids at a young age because this can only help them when it comes to exams and, later, interviews for jobs and college places. We’re going to be sticking with First News this year and I have a brilliant trial offer if you would like to subscribe for your kids. Simply go to www.firstnews.co.uk/blog17 where you can try 5 issues for just £1. After the first 5 issues, your subscription will continue at a price of £15.99 every 3 months. There is no obligation and you can call or email to cancel your subscription at any point and no further money will be taken. Please note: this offer is for the print edition of the newspaper. If you’d like to learn more, you can also reach First News on Twitter @First_News or Facebook at www.facebook.com/FirstNewsUK. *we received copies of the paper for the purpose of this review. "Are Your Kids Working Harder Than You Are?" "Win A Global Gourmet Indian Curry Station By Sensio Home"